Noemi Ibarz was born in Lleida, Spain in 1974. In 1998 She graduated in fine arts from the University of Barcelona, in the speciality of engraving. 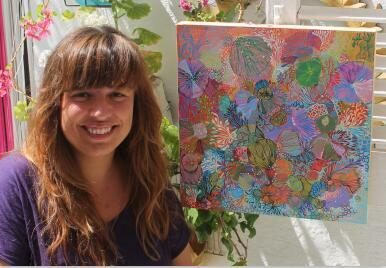 She has worked for 15 years in textile design, combining this work with exhibitions of her paintings. 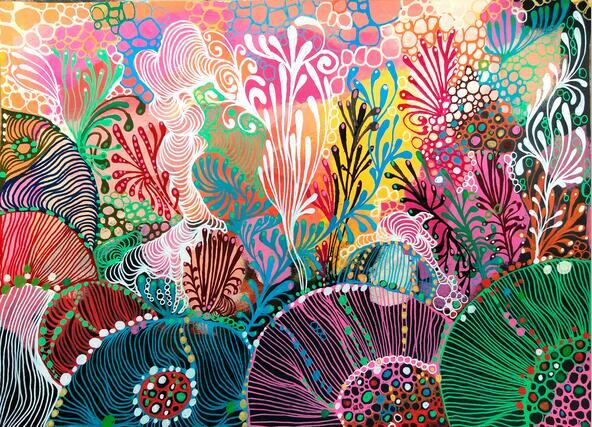 Attracted by nature, the organic lines of her works combined with vibrant colours make her art very pleasant for the viewer, who can lose itself between the details of their works like in a walk in the woods or down the sea. She loves the work of classic painters like Klimt, Mucha, Schiele, Klee and others mainly from Modernism and Art Nouveau. Her works are painted mainly with acrylic paint and Posca Markers (Acrylic +gouasche paint). She doesn’t work with previous sketches, starts a painting and never knows how it will end, like the intuitive painting.